This is a swell mechanical keyboard that knows its target audience well, but could stand to use a firmware fix and ditch the membrane dome-switched function keys. I must admit that I’m heavily biased towards the use of aluminum in anything. From the aesthetics of my computer cases to the smooth feel of a soda can, there’s something about the material that’s just perfect. That’s why I was so enamored by the Vengeance keyboards when they first arrived at my doorstep for review; the brushed aluminum frame is as unique as it is prominent. 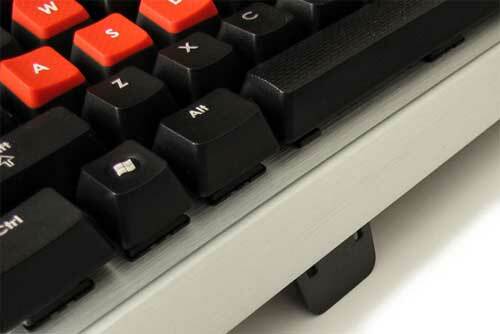 Whereas most keyboards will partially shroud the bases of the keys in a deep plastic housing, Corsair opted to go a different route and leave the keyswitches fully exposed, using their sturdy aluminum plate mounting as the face of the keyboard itself. The end result is an incredibly sleek, utilitarian look that basks in its own simplicity. As an added bonus, the lack of a shroud means the Vengeance K60 is remarkably easy to clean. Any crumbs, dust or hair that accumulates under the keys is now a breeze to get at since there’s a clear path for an air duster’s straw as well as an exit path for the debris. 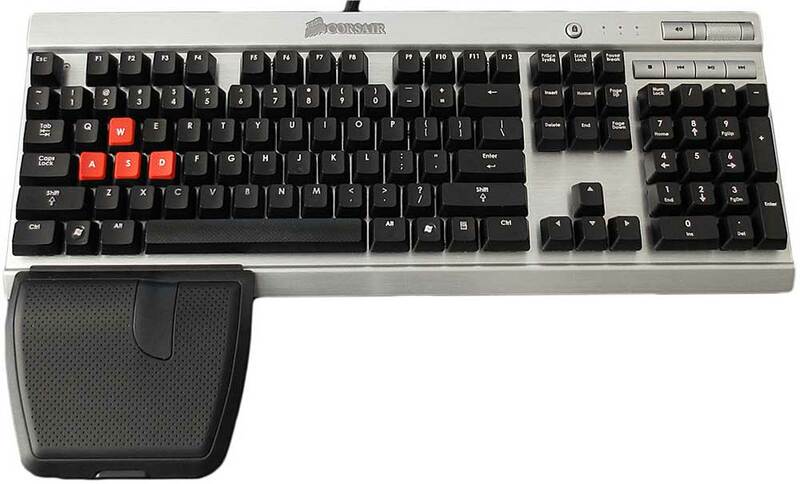 Complementing the brushed metal look are some plastic multimedia hotkeys in the top right corner that are painted to match, along with a textured metal volume roller that’s highly reminiscent of Logitech’s gaming keyboards (i.e. G19, G110, G510) from 2009 onwards. The sheer drop from the adjacent number pad to the low profile playback buttons does take some getting used to, but also does well to prevent accidental keypresses. Personally, I very much prefer the discrete multimedia controls offered by Corsair here as opposed to the function-shifted F-keys keys that all the other mechanical keyboards use. (Why is this?!) And the volume roller, well, there’s just no way to improve on its absolute corner placement and smooth stepping. The Vengeance K60 features an incredibly thick, braided USB cable that leaves little to question about its durability. Towards the end of the cable you’ll find that it branches out into two separate USB connectors. One plug is for the keyboard itself, while the other serves as a pass-through extension cable for the solitary USB 2.0 port at the back of the keyboard. I would have liked to see a 2-port hub here instead of a pass-through if only for connecting a gamepad or USB flash drive alongside my mouse, though I do appreciate the stability attained by a direct connection to one of my motherboard. At least Corsair learned from Razer’s mistake and placed the port at the rear of the keyboard instead of the right edge where I’m keen on using my mouse. You won’t find any analog headset ports on the K60, but that’s okay with me as a USB headset reviewer. 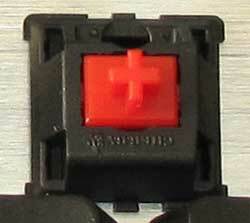 Of course, the biggest draw to the Vengeance keyboards is their use of Cherry MX mechanical keyswitches. Each key contains its own metal spring and plunger design, which greatly improves on the feel of the keys and also their reliability–rated at 50 million keystrokes per key. Contrast this to your standard membrane dome-switched keyboard that’s sole purpose in life is to cut costs and offer you, well, a keyboard. They’re good enough to get tasks done, but the silicone membrane beneath the keys is rated for only 2-10 million keystrokes per key and will feel mushy or uneven in comparison. The tactile difference between a mechanical keyboard and a dome switch keyboard is simply night and day. If you’re a skeptic, find a friend or store that has a mechanical keyboard you can play with and feel the difference for yourself. With regards to noise levels, I do find the linear action of the Cherry MX Reds much more conducive to atmospheric gaming than the comparatively loud Cherry MX Blues, particularly in games like Metro 2033 where the subtle noises of the tunnels set a rather dismal mood. All of the Cherry MX keys do however produce substantially more noise than an ordinary dome switched keyboard, caused by the impact of the keycap bottoming out on the keyswitch. 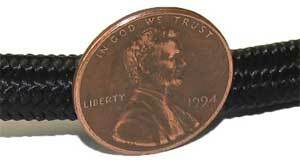 It’s possible to lessen this effect by installing rubber O-ring dampeners on the interior of the keycap, which may be worth looking into if you find yourself staying up for late night gaming sessions while others are sleeping. It should be noted that the Vengeance K60 is not entirely mechanical. The top row of keys as well as the Insert-PageDown cluster are actually your garden-variety dome switch keys, which I find to be rather unfitting for a mechanical keyboard. Corsair explains this unusual choice on their blog by saying this was done to prevent double-keystrokes with tuned silicone as well as place them on a lower plane than the typewriter keys, but I personally find the experience to be more than irritating. Here I am, well over a month into this review, and every time I press Shift-Home I find myself distracted by how mushy the second keystroke feels. Hopefully, Corsair can right this decision with their next generation of keyboards. The black keys offer a clean contrast to the silver plating they’re mounted on and feature laser-engraved white lettering that’s easy to read. Unfortunately there’s no backlighting to be found here, though you can get that on the MMO-oriented Vengeance K90 keyboard if you’re willing to pony up an additional $20-30 and lose the other K60-centric features like the gaming rest and special keycaps. Keycap quality is hit and miss. The hard plastic feel of the keys is fantastic and in my opinion better than the softer touch of the Vengeance K90, though you can feel and pick at the laser-etched lettering that appears to have been a thin coating on top of the actual plastic. Corsair should have gone the Deck route and used a double-shot injection molding, but this admittedly would have driven up the cost quite a bit. Unfortunately, many of the early batches of Vengeance K60 keyboards including my own press sample suffer from fading lettering that turns grey with finger oils. This is caused by a material problem, though apparently it’s been resolved at the factory not too long ago. There’s still likely to be a number of defective keycaps on store shelves for a while though, so I feel it’s important to bring light to the issue. Unlucky users who experience this problem themselves should fill out an RMA request for a free replacement with return shipping covered by Corsair. It’s a shame that the defect wasn’t caught during the QA process since it exposed itself in less than two weeks of my own testing, but I will give credit to Corsair for seeing to it that affected customers are taken care of. Apart from the utilitarian design and use of mechanical keyswitches, the other major draws to the Vengeance K60 are its nods towards FPS gamers. 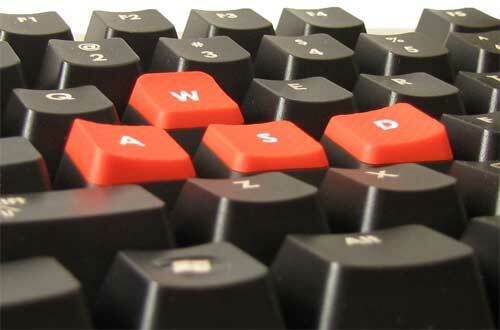 At your choosing, the WASD and 1-6 keys can be swapped out for contoured keycaps with a bright red topping. The topping is made of rubber and has a coarse textured feel that gives it plenty of grip, matching the textured pattern on the spacebar. 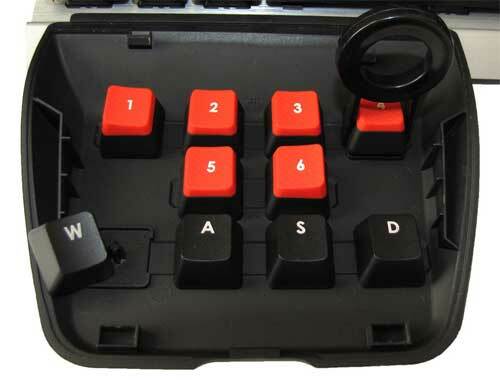 Granted, it’s rather unlikely that a seasoned gamer would loose bearings on the WASD cluster, but the excellent feel of the WASD keyswaps is that much more reassuring and should prove useful to anyone making the jump from console to PC gaming. Typing with the WASD keys in place does seem a bit awkward at first, but you quickly get used to it. As a matter of fact, I’m typing this entire review with them in place and don’t give them a second thought anymore. As for the replacement 1-6 keys, I prefer not to use for two simple reasons. First, I love to play Unreal Tournament which utilizes all 10 number keys, so I find the height transition from the 6 to 7 keys to be a bit jarring. 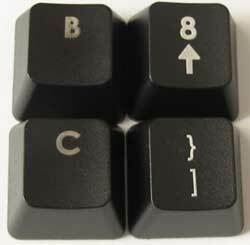 TF2 players should have no problem with the 6 keys unless they’re a spy, but I personally can’t be bothered to swap out the keysets every time I switch gaming binges. Second, you’ll notice that only numbers are printed on these keys, not the special characters !@#$%^. Apparently, this is intentional. Though I am able to touch type, I still find myself hunting and pecking for these symbols every now and then, and novice typists may have an even more difficult time. 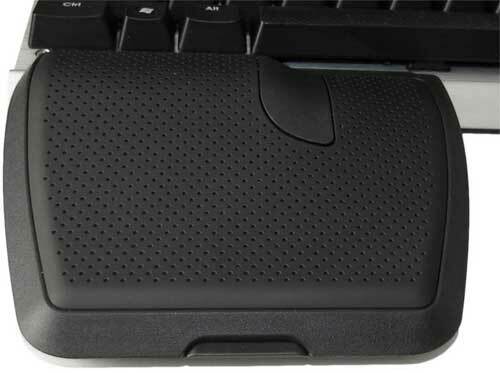 Corsair has further confounded the issue by releasing marketing images that clearly show the keys with special characters, prominently displayed on the K60’s box art and reseller websites. Though Corsair has fixed the images on their own site and Micro Center’s, as of this writing you can still see the special character images at several e-tailers if you do a quick stroll through Google Products. An honest mix-up no doubt, but lurking through various forums reveals a number of users who fell victim to this mistake and are rightly upset. This should not have happened. Another FPS-centric feature of the Vengeance K60 is the gaming wrist rest, providing the left hand support that’s squarely positioned for the WASD movement cluster. If you look closely, you’ll notice that the right third of the rest is sloped downward for the thumb, better positioning it to hit the spacebar. The wrist rest can be removed from the keyboard just like any other, which I gather a number of users have done since the wrist rest is admittedly unconventional. That said, I personally find it incredibly comfortable to use in Tribes Ascend and Quake Live, though only when the kickstands positioned along the spacebar edge of the keyboard are deployed. That’s right, the K60 is one of the very few keyboards to actually actually have a reverse tilt! If only more keyboards could copy this feature. Sadly, the Vengeance K90 misses out on the party. The wrist rest doubles as keycap storage, providing stems for the replacement keys to clutch onto as well as a keycap puller tucked away into the the lid. It should be noted that the keys are standard size and use the same stem as any other Cherry MX keyswitch, so any of the custom keycaps you see floating around the GeekHack forums, WASD Keyboards or eBay will work on this board. To my knowledge there aren’t any contoured keys like the K60 offers, but there’s plenty of other designer keys you can use to customize to your heart’s content. Well, almost. Remember, the Esc/Function/PrtScn/Ins clusters aren’t mechanical and thus use a different type of keycap. 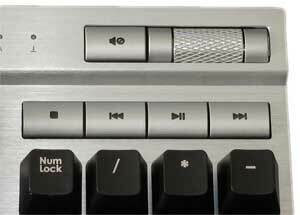 Another major gaming feature is the 20-key rollover (20KRO), allowing for any combination of 20 keys to be pressed simultaneously using a USB connection. This is particularly useful for a few niche applications that make full use of the keyboard such as console and arcade emulators, Frets on Fire and left-handed keyboard mappings that make liberal use of the number pad and arrow keys. Contrast this to Razer’s BlackWidow, which optimizes its key matrix to prevent jamming around the WASD cluster but still blocks the Z+X+C combination, or a non-gaming Logitech Illuminated Keyboard, which alarmingly blocks the W+Shift+Space combo. Even when those keyboards aren’t jamming keys to prevent ghosting, they’re still limited to only six simultaneous key presses as are most other USB keyboards. So while you may not have a need for all 20 keys, 20KRO does provide the peace of mind that your keystrokes will never falter. 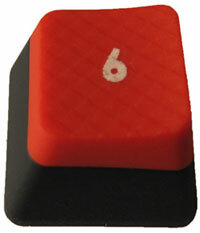 Rounding up the gaming features is a Windows key lockout button, located just above the Scroll Lock key. It functions just the same as the lockout toggles found on Logitech and Razer boards, effectively disabling the deadly time bomb in waiting. 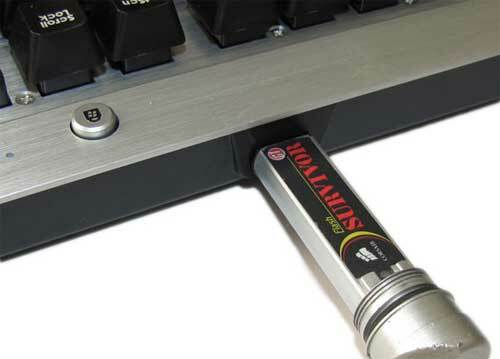 This is incredibly handy if you play MAME titles on your computer with standard keymappings that make heavy use of the Ctrl and Alt keys, as well as the general contingency that you may resort to keyboard bashing after getting killed by a 12-year old with a microphone. Play it safe and lock that button out. There is one glaring bug with the Vengeance K60 and K90 that you should be aware of. On occasion a key may stick down, infinitely repeating itself until the offending key is pressed a second time. Only, the physical key isn’t actually stuck, Windows just thinks that it is. The effect isn’t always instant, and may take a few seconds for the key to start repeating after it was initially hit. Over the course of a few weeks, this bug has so far resulted in me continuously moving backwards in Quake Live once, along with five instances of the backspace key going rogue while I’ve been writing reviews. Irritating, yes, but infrequent and easily fixed by an extra death or a Ctrl-Z. For tournament players, however, this contingency means more than a stupid death; it means your ranking and livelihood. I’d advise any pro gamer to avoid buying a Vengeance keyboard until this bug is confirmed squashed. You’ll want to check on these forums and particularly this thread for updates in the mean time. Corsair has mentioned to me that they believe the issue lies with the polling rate and have also hinted at a firmware fix to address the issue sometime in the future. In proper FPS form, the timetable given for the fix is when it’s done. Whenever that is. Frustrating, but I suppose it’s better than Valve Time. For Corsair’s first stab at a making a gaming keyboard, there are obviously a few areas for improvement. Getting rid of the dome-switched function keys should be step one, but also it wouldn’t hurt to offer the same backlighting as the Vengeance K90; not everyone wants that keyboard’s extended layout but the desire for illumination is almost universal amongst gamers. And while I do prefer the Cherry MX Red keys over the clicky Cherry MX Blue keys, this is clearly going to be a matter of subjective taste. Offering multiple editions of the Vengeance K60 with different keyswitch types like some competitors do might stand a better chance at attracting gamers and typists who prefer tactile or stiffer keys. Overall, however, I’d say that Corsair did a fantastic job with their K60 and is deserving of our praise. Not only did they up the ante for gaming keyboards by using mechanical keys that easily outclass any Microsoft or Logitech keyboard I’ve ever used, but they raised the bar over every other mechanical keyboard through dedicated media controls, full 20KRO, a comfortable gaming rest, and some very fine WASD keys. Just as importantly, the K60 manages to achieve a unique look with its aluminum plate design that exceptionally easy to clean. All things considered, I highly recommend the Vengeance K60 at its $90 street price, though I’d advise tourney gamers to hold off until a firmware fix is released for the occasional repeating key bug.